For many years, Pine Bluff had the second largest Jewish community in Arkansas after Little Rock. Located in Jefferson County along the banks of the Arkansas River, Pine Bluff became a bustling market town that attracted growing numbers of Jews in the late 19th century. Cotton farming was king in the rural areas around Pine Bluff. Once the town was linked to Little Rock by railroad in 1881, Pine Bluff developed industry and grew into the third largest city in the state by 1900. Jews first arrived in Pine Bluff in the 1840s. By 1855, there were about ten Jewish families in town, and several Jewish-owned businesses. Isaac Altschul opened a dry goods store outside of Pine Bluff in 1852. The store was in the midst of several slave plantations, which Altschul catered to. In addition to serving plantation owners, Altschul would stay open on Sundays to be able to trade with slaves on their day off, working the counter himself. Altschul was a very successful businessman. In 1860, he had $10,000 in personal property, which included one slave. One of Altschul’s employees and boarders was Henry Morton Stanley, who later became a journalist and explorer famous for finding missionary David Livingstone in Africa (“Dr. Livingstone, I presume”). Stanley came to Arkansas when he was nineteen and lived with Altschul while he worked at the store. According to Stanley, the plantation owners looked down on Altschul since he was foreign-born, a merchant, and a Jew to boot. In the rural, plantation economy of the antebellum South, Jewish merchants were outsiders who were socially inferior to the planter elite. With the rise of the new, commercial South after the Civil War, Jews in Pine Bluff and the rest of the South led the way and emerged as community leaders. Altschul moved to Pine Bluff after the Civil War; many of his relatives came to join him as they became one of the most prominent Jewish families in town. Many Jewish peddlers passed through Pine Bluff before the Civil War. 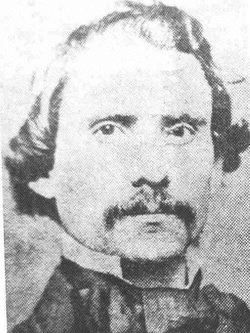 Gabriel Meyer was a peddler who got stranded in Pine Bluff by a flood in 1856; his extended stay in town convinced him to remain, and Meyer soon opened a store in town. David Blumenthal arrived in 1860 and opened a hotel that catered to these traveling peddlers. Although these German Jews had not been in America for very long, several Pine Bluff Jews fought for the Confederacy. While this service reflected their loyalty to the South, they also remained loyal to the Jewish people. While the Union Army occupied Pine Bluff, local Jews would offer hospitality to Northern Jewish soldiers. One Jewish Union soldier wrote about being invited to a local Jewish family’s home for Rosh Hashanah. This soldier later returned the favor by helping two local Jews to recover horses that had been taken by the Union Army. After the Civil War, there was an influx of Jews into Pine Bluff. By 1878, 250 Jews lived in town. In 1866, Pine Bluff Jews had organized a local B’nai B’rith lodge; the following year they founded a congregation, Anshe Emeth. By 1879, there were three B’nai B’rith lodges in town, as well as branches of other Jewish fraternal organizations, including Kesher Shel Barzel (Bond of Iron) and the Free Sons of Israel. There was also a Ladies Aid Society and a Ladies Relief Society, both of which provided charity to members of the Jewish community. They also formed purely social organizations. In 1872, Jewish men founded the Bluff City Club, which later became the Harmony Club. Jewish women created their own social club, called the Entre Nous Eucre Club. Charles Wessolowsky, the Southern organizer for the International Order of B’nai B’rith, came to Pine Bluff in 1878 and found an active Jewish community that was thriving economically. He discovered that some Jews had acquired land and become cotton planters. Gabriel Meyer, who first came to Pine Bluff as a peddler, owned 19 plantations, “all of which are cultivated very successfully.” Sol Franklin had once owned two river steamships, both of which had sunk. Franklin decided to try his luck with cotton, and bought a cotton plantation. By 1878 he owned 1900 acres of land and eventually became one of the largest planters in the state. In 1872, Franklin had a novel idea to find sharecroppers to work his land. He offered to sponsor 200 Romanian Jews, and pay for their transportation to the U.S. and Arkansas, if they would settle on his land and grow cotton as sharecroppers. While the editor of the Jewish Times newspaper in New York scoffed at the plan, it attracted serious attention from some Jewish leaders in Europe. Nevertheless, Franklin’s plan never reached fruition, and he had to rely on local people to work on his farm. By the 1890s, Franklin’s economic fortunes and health had declined. The same day his plantation was sold to pay off debts, Franklin died of heart failure. Sol had ten children, many of whom became prominent businessmen and citizens in Pine Bluff. The Jewish community grew significantly in the late 19th century as many Jews moved to Pine Bluff to open stores, relying on the area’s farming economy. In 1881, there were 30 Jewish-owned businesses in town. 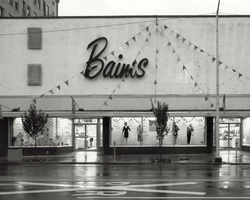 They were usually retail stores specializing in dry goods, groceries, clothing, jewelry, or junk. By 1905, an estimated 425 Jews lived in Pine Bluff; they continued to concentrate in retail trade through much of the 20th century. A wave of Eastern European Jews came to Pine Bluff in the early 20th century. They followed the same economic path as the earlier German immigration, though they formed their own separate Orthodox congregation, B’nai Israel. Pine Bluff Jews were very involved in civic affairs and local politics, with two having served as mayor. L.E. Goldsmith was elected by a large majority in 1895. He spent much of his term as mayor working to restore the fiscal health of the city. Although he was popular, Goldsmith did not run for re-election because of his poor health. Simon Bloom, a prominent local cotton grower, served three terms as mayor, from 1913 to 1919. During the first campaign, Bloom’s opponent used anti-Semitic appeals, but found the tactic to be unsuccessful. Several other prominent Pine Bluff Jews served in local government. Gabriel Meyer was a city alderman for ten years, but was especially devoted to the public schools, serving on the school board for 21 years. In the 1860s, when the city did not have the funds to pay its teachers, Meyer paid their salaries out of his own pocket. He then negotiated a loan from an east coast bank to cover the schools’ shortfall. Known as the father of the Pine Bluff school district, an elementary school was later named for him. Many other Jews served on the city council, including David Aschaffenberg, Nathan Cook, Charles Weil, and his son Ben Weil. Charles Weil, a prominent local merchant and planter, was a longtime director of the appropriately named Merchants and Planters Bank. Weil was president of the Anshe Emeth congregation for 30 years, and was very active in the local B’nai B’rith lodge, which was renamed in his honor after he died. Irving Reinberger, who moved to Pine Bluff in 1892, was an attorney who served as assistant District Attorney and City Attorney. His two sons also became lawyers and joined their father in the family firm in Pine Bluff. Maurice Reinberger became a successful criminal defense lawyer who specialized in death penalty cases. Sam Hilzheim, the manager of the Pine Bluff Opera House, served in the state legislature in the 1890s. When another member made a disparaging remark about Jews, Hilzheim upbraided him publicly. The most prominent and long-serving Jewish politician in Pine Bluff was Sam Levine, who spent 20 years in the state legislature as both a representative and senator in the 1930s and 1950s. During the integration crisis at Central High School in Little Rock, Levine was an outspoken voice for following the mandates of the U.S. Supreme Court. In 1959, he filibustered a bill that would have packed the Little Rock school board with segregationists. While Levine’s stand may have been morally right, it was not good politics at the time, and he chose to retire after that legislative session. He later ran for chancery judge in Pine Bluff, but lost in the primary by only ten votes to an opponent who openly used anti-Semitism during the campaign. The anti-Semitic candidate was later defeated in the general election. Jews have also distinguished themselves in the field of journalism in Pine Bluff. Frank Silverman was owner and editor of the Jefferson Republican newspaper during the period after the Civil War. Silverman also served as sheriff and county judge. Meyer Solmson grew up in Pine Bluff and became editor of the Pine Bluff Daily Graphic when he was only 21 years old. His tenure was occasionally controversial. He once criticized local citizen J.E. 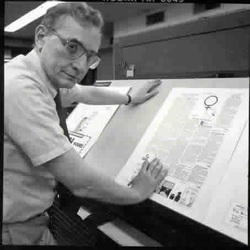 Simmons in an article, after which Simmons threatened to kill Solmson. The young editor later shot and killed Simmons in self defense. Eventually, Solmson moved to St. Louis and then New York, where he became the managing editor of the New York Morning Telegraph and later Variety. Paul Greenberg came to Pine Bluff in 1962 to write editorials for the Pine Bluff Commercial. He won the Pulitzer Prize for commentary in 1969, and went on to receive several other national awards. A syndicated national columnist, Greenberg became editorial page editor of the Arkansas Democrat Gazette in 1992. While Pine Bluff grew after World War II, the Jewish community has declined significantly since 1960, when 455 Jews lived in town. By 1984, only 175 Jews lived in Pine Bluff. Today, Anshe Emeth has only 17 members. At one time in the early 1920s, Pine Bluff had three different congregations, several Jewish social organizations, and a thriving community. Today, one small, struggling congregation is all that remains. The F.M. Altschul Company, which had been the oldest business in Pine Bluff, closed in the 1960s. Several other Jewish-owned businesses closed in the 1980s. Today, only a few such businesses remain. This decline can’t all be blamed on the economy since Pine Bluff itself has not lost population and has even attracted various industries to the area. Pine Bluff’s Jewish community has shrunk because the Jewish merchant class has largely died out across the South as the retailing business has shifted to large chain stores. Jews raised in Pine Bluff by merchant parents have gone on to become professionals and moved to larger cities in the South and beyond. Still, the legacy of Pine Bluff as a Jewish center lives on.